Private labeling has a big learning curve. You need to learn about what to look for in a product, where to find the product, how to sell the product, and then you need to hope it actually sells. It's a lot of work and for most people, it's hard to take the plunge into the world of PL. Fortunately, you don't have to private label a product on Amazon to be a successful seller. There are many other ​ways to make money as a seller including bundling! Bundling products on Amazon is basically exactly what it sounds like. The idea is to take several separate products (ie. a spoon, a placemat, and a bowl) and bundle them into one Amazon listing. You could even take two or more of the same product and bundle them together and create a new listing that way. The point of doing this is to create a bundle of products customers want, so instead of having to find all of these items separately, they can just buy your bundle and be done. The idea is to create convenience for your customers. 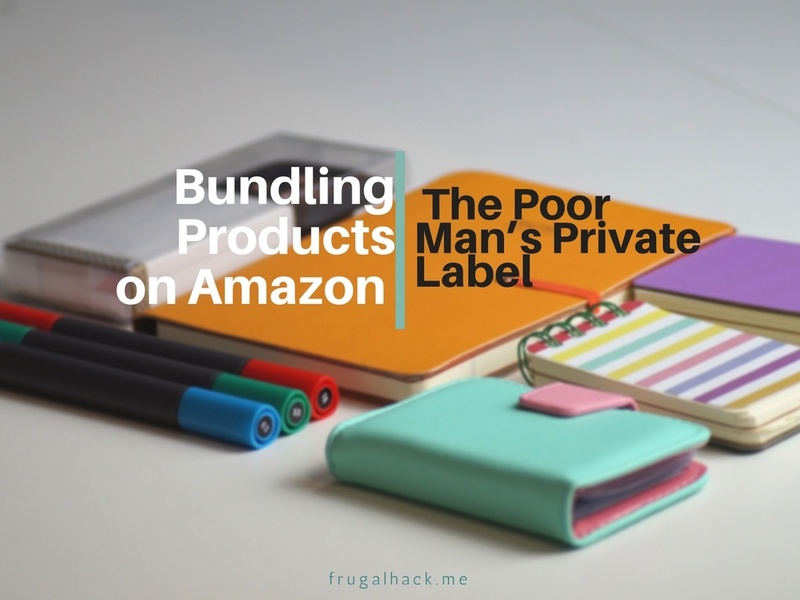 As mentioned in the title of this post, bundling is the poor man's private label. By that I mean, it's easier, usually cheaper, and, more often than not, significantly faster than PLing​. What Products Should You Bundle? There are a few ways to determine what products you should bundle; Intuition, Amazon, Long Tail Pro, and Merchant Words. Using your intuition to build a bundle is a quick and free way to do it, however, it's also the most risky. I'm not saying it's a bad way to do it, as I've made a lot of money building intuitive bundles on Amazon, but it's significantly less risky when you use tools to find products to bundle. Let's say you just signed up for a new wholesaler that sells different styles of measuring cups and measuring spoons. None of their products are on Amazon, but you think you could bundle of a set of cups and spoons together into one bundle and they'd sell. This is a great example of using your intuition to build a bundle, because you don't know what people think of this company's products. You don't know if they will sell. You don't even know if people will pay a premium for a whole set of measuring cups and spoons. What you do know, however, is that you can get the products cheap, they're not likely to break in shipping, and that you would love a set of matching measuring spoons and cups, so others probably will as well! Using Amazon's own website, you can easily determine what products sell well together on Amazon. They give you that information on every product page which makes this whole process much easier! 2. Scroll down until you you see a section that says "Frequently Bought Together." Do you see that? Amazon is literally telling you that customers regularly buy this bundle of products together! Having this information available to you is almost like cheating! Amazon does all the hard work for you, all you have to do is source these products, create a bundle and BAM, customers will buy it. You already have the proof right here that customers buy these products together, so you know it will sell. And best of all, this method is completely free! Now that we've covered the free options, let's look at the paid options. Long Tail Pro is keyword research tool that shows you what keywords people are searching for and how often they're searched. It also shows you a lot more information about search competition and the like, but that's unimportant for bundling. Long Tail Pro is by far my favorite keyword research tool. It's quick, easy to use, and provides a lot of great information. I primarily use it to research keywords for my websites, but I also regularly use it for Amazon. 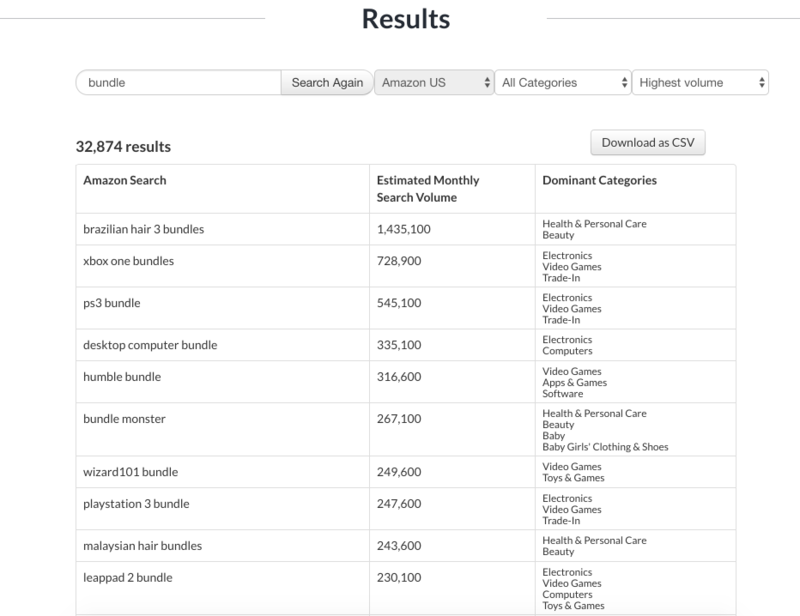 LTP only searches Google keywords not Amazon, but that's okay, because the bundles they are searching on Google will bring up bundles selling on Amazon. LTP is regularly $37 per month, but at the time of this writing it's on sale for $25 per month and features a 7 day trial. If you don't have a product bundle in mind or need more keyword ideas, I suggest heading over to ubersuggest.io. Uber Suggest is a free web app that gives you hundreds of keyword ideas based on what you type in. For example, you could type in: "bundle of" and it will bring up a whole list of keyword ideas to plop into LTP. Once you have some keywords to get LTP started, you can enter them into the "Google Adwords Suggestions" box if you want more keyword ideas to be generated from the keywords you entered. Alternatively, you can enter your keywords into the "Manual Keyword Entry" box if you want the exact keywords you entered to be searched. Next, run the search and see what comes up. As you can see, there are some good options to get you started. People are clearly searching for these bundles, so you can quickly see that there is a market for these. The volume column indicates how many people are searching for that keyword in a month. ​Merchant Words works just like Long Tail Pro, but instead of telling you what keywords are being searched on Google, it tells you what keywords are being searched on Amazon. This is arguably a better option for Amazon sellers, however, the web app has been known to show some incorrect search values on occasion - not a huge deal, but something to keep in mind. Merchant Words costs $30 per month and you can cancel any time. To start searching Merchant Words, simply sign-up on their website and enter your keyword into the search bar. It's that easy! If you need keyword ideas, you can search Uber Suggest, as mentioned above. As you can see, Merchant Words brings up all the relevant information for your search (the keyword and the volume). With that information, you can easily figure out some good bundle ideas to create. Where Should You Source Products to Bundle? Once you've come up with some bundle ideas, you'll want to source your bundle. So, where do you do that at? Frankly, you can source your bundle from anywhere. For example, I've created bundles with products from wholesalers, from Walmart, and even from Amazon itself. Wherever you can find the best price is where you should source your products to bundle! If you source your bundle from different sources (ie. one item from a wholesaler, one item from Walmart, and one from Amazon) you have a better chance of keeping other sellers off your listing, because they won't be able to find all the products in the bundle. Those are just a few bundle ideas, but it should give you an idea as to just how many possibilities there are! When bundling a product on Amazon, you'll need a barcode for the AZ listing. You can get these on eBay for pennies on the dollar (usually at $0.01 per barcode). When searching for these barcodes make sure they are GS1 barcodes to ensure they will work on Amazon. Bundling is a great way to increase your sales and add a replenish able product to your Amazon account. If you don't want to start Private Labeling just yet, then bundling is a good alternative! Do you have any experience bundling? If so, what has and hasn't worked for you?